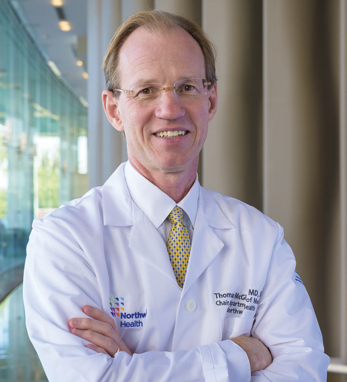 Thomas G. McGinn, MD, MPH, is Deputy Physician-in-Chief and Senior Vice President at Northwell Health, and Chair of Medicine and David J. Greene Professor of Medicine at the innovative new Hofstra Northwell School of Medicine. Dr. McGinn is overseeing and coordinating the rapid expansion of Northwell, New York State’s largest healthcare provider and private employer, including its vast network of more than 5,000 physicians in its independent practice association and more than 2,500 employed faculty. The foundation of Dr. McGinn’s research and clinical programs is his belief that every patient deserves the best available evidence-based, highly integrated care and that health outcomes research can immediately transform healthcare delivery to reduce waste and enhance the quality of care. He was an early researcher in the health benefits of evidence-based medicine, preventive care, and patient empowerment, well before the Affordable Care Act institutionalized these principles. He is known nationally and internationally for his pioneering research and teaching in these areas, serving in leadership roles in the major forums for continuing research and dissemination of these disciplines. He has published more than 100 peer-reviewed journal articles, numerous book chapters, and various social media programs. Doctors and brothers, Joseph and Thomas McGinn, come from a highly medical family: their father, uncle, brother, sister-in-law, and nephew all hold prominent roles in health care and the title “Dr. McGinn.” They are third-generation Irish American with both paternal and maternal roots in County Tyrone, the brothers were raised in New York City’s “Irish Riviera” – Breezy Point, where several family members continue to make their homes. The brothers are both enthusiasts of traditional Irish music and closely follow the Irish national rugby team and Gaelic sports.